SAS964 is ideally suited to saloon style racing such as GT Racing with excellent, consistent torque characteristics allowing the driver to be less aggressive with the brake pedal whilst still achieving improved braking forces. SAS964 is ideally suited to saloon style racing such as GT Racing with excellent, consistent torque characteristics allowing the driver to be less aggressive with the brake pedal whilst still achieving improved braking forces. This means the brake package is not being punished and the driver does not need to push as hard on the brake pedal. Capable of operating at extreme temperatures, SAS964 is also kind to the rotor. SAS964 is commonly used as a front pad in front-engined vehicles along with SAS871 in the rear. 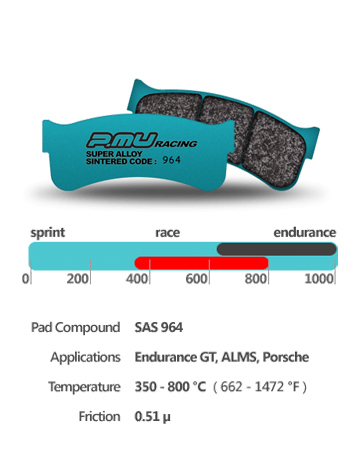 For mid-engined vehicles that thend to use the same pad compound front and rear, use SAS964 all-round.